As political crisis worsens, president suspends parliament and Wickremesinghe’s opponents threaten to storm residence. Colombo, Sri Lanka – Political opponents of Sri Lanka’s sacked leader Ranil Wickremesinghe have given him a Sunday deadline to vacate the prime minister’s official residence amid a deepening constitutional crisis in the Indian Ocean nation. Wimal Weerawansa, a member of parliament, told reporters on Saturday that Wickremesinghe – who insists his dismissal on Friday was unconstitutional – has until 8am local time on Sunday (02:30 GMT) to leave the house “in a dignified manner”. “We have filled giant stadiums while in the opposition. Imagine what we can do with state power,” he said, in an apparent threat that protesters would storm the building if Wickremesinghe failed to leave. The warning came hours after President Maithripala Sirisena suspended the country’s parliament until November 16, and dismissed Wickremesinghe’s cabinet, in a move critics decried as an “undemocratic coup”. The political turmoil began on Friday, when Sirisena withdrew his United People’s Freedom Alliance (UPFA) from the ruling coalition, led by Wickremesinghe. Later in the day, Sirisena fired the three-time prime minister and replaced him with Mahinda Rajapaksa, a former president accused of corruption and human rights abuses, in a rushed ceremony in Sri Lanka‘s capital, Colombo. The moves prompted Wickremesinghe, who was touring the south of the country at the time, to return to Colombo immediately. On Saturday, during a press conference in which he was flanked by members of his coalition, he urged Speaker Karu Jayasuriya to convene parliament to “resolve” the political crisis. “I have the majority in parliament, convene the parliament to resolve this,” Wickremesinghe said at Temple Trees, the prime minister’s residence. “Only parliament can show who has the majority,” he added. According to the website of Sri Lanka’s parliament, Wickremesinghe’s United National Party (UNP) has 106 seats in the 225-member House, while Sirisena’s UPFA has 95. 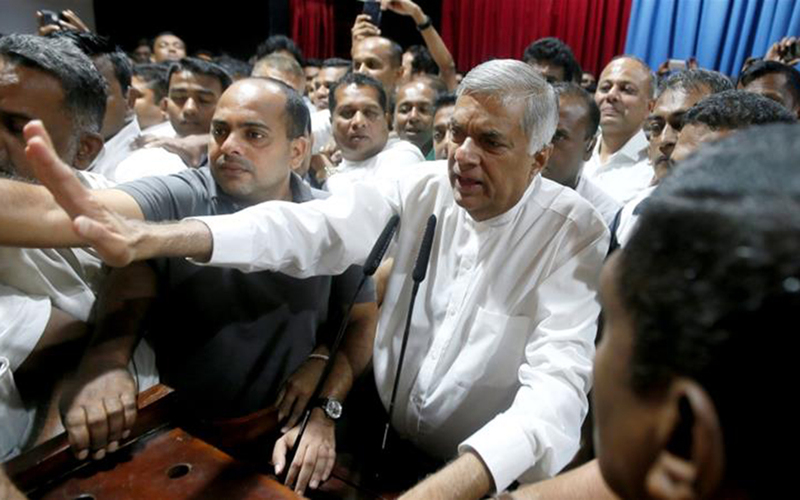 The UNP, citing constitutional amendments passed in 2015, argues the president no longer has the authority to sack the prime minister and says a vote of no-confidence by the parliament was necessary to remove him. The UFPA disputes that. Sirisena and Rajapaksa have not publicly commented on the deadline given by Weerawansa. Amid the uncertainty, Pujith Jayasundara, inspector general of police, cancelled police leave “until further notice” and increased officers on patrol across the country. The streets of Colombo remained quiet throughout the day, except for the occasional celebratory firecracker from Rajapaksa’s supporters. Members of the former president’s party in the country’s south also held rice-pudding feasts to mark his return. Several countries issued travel advisories urging caution, while the ambassadors of European nations, including the United Kingdom, France and Germany called on “all parties to fully act in accordance with Sri Lanka’s constitution” and “to refrain from violence”. The United States said it was watching developments closely. Wickremesinghe met with diplomats from Western countries at Temple Trees late on Saturday. China’s envoy, who had sent a congratulatory message to Rajapaksa, had also called on the sacked prime minister earlier in the day. The recent developments mark a dramatic fallout for Sirisena and Wickremesinghe, who joined forces ahead of a 2015 election to defeat Rajapaksa, who ended Sri Lanka’s 26-year long civil war against Tamil separatists. A relatively obscure politician until a few years ago, Sirisena ran on a platform of economic reform and accountability for alleged atrocities committed at the close of the country’s bloody war in 2009. He was elected president largely thanks to the backing of UNP. However, relations between the pair have soured in recent months amid disagreements over economic policy and day-to-day administration of the government. 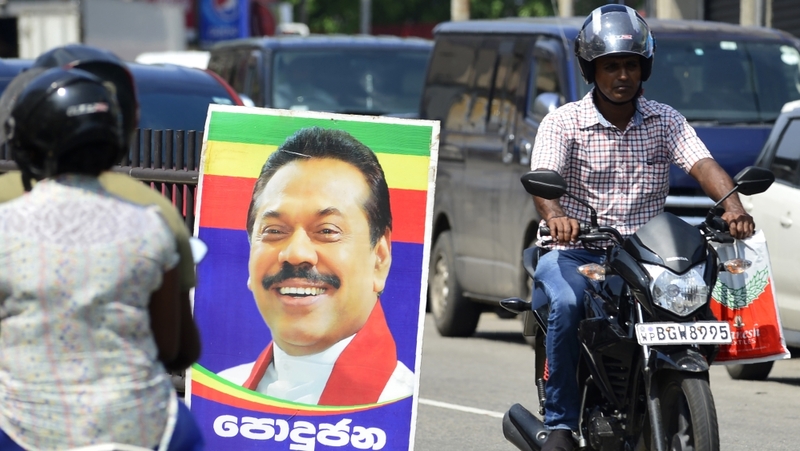 In February, both of their parties suffered humiliating losses to Rajapaksa’s Sri Lanka Podujana Peramuna (SLPP) in local council elections amid widespread public dissatisfaction over higher taxes and rising cost of living. After his party’s strong poll showing, Rajapaksa said the ruling coalition has lost its mandate to govern and called for snap elections. The call was rejected by Sirisena and Wickremesinghe, but relations between the two continued to deteriorate. “It’s hard to believe that the man who assumed power nearly four years ago after contesting elections as a common candidate – at the invitation of Ranil Wickremesinghe – would turn around and take such action against the very person who put him in this seat,” Mangala Samaraweera, media and finance minister in the sacked government, said in a video posted to Twitter. He also said Sirisena had ordered the removal of Wickremesinghe’s security detail. Al Jazeera could not verify the claim immediately. Eran Wickramaratne, a UNP MP, urged supporters to be “patient” in a statement on Twitter on Saturday, saying the party intended to “take legal action” in the coming days. For his part, Dayasiri Jayasekara, spokesperson for Sirisena, dismissed allegations of wrongdoing, pointing to a constitutional provision that says the president can appoint a prime minister who commands the parliament’s support. “It’s obvious that Prime Minister Mahinda Rajapaksa commands the support of the majority of parliament. Therefore the claim that this is unconstitutional is false. Already a UNP MP has joined our ranks and in the coming days a number of others will join,” he said. Ananda Aluthgamage, the UNP politician who backed Rajapaksa, told reporters that more than 20 legislators from his party would back the former president. Several rights activists and lawyers, however, said they were concerned by Sirisena’s moves. Gehan Gunatilleke, a human rights lawyer, called the president’s actions “undemocratic” and “an abuse of power”. Friday Forum, a group of prominent public intellectuals, also condemned Sirisena’s actions in a statement, saying they “demonstrate a flagrant disregard of the mandate he received from a majority of voters who … voted for a change of regime from the Rajapaksa style of governance”. In a move that has prompted further concern, editors at the public media company Lake House accused supporters of Rajapaksa of trying to seize control of the company’s daily and weekly newspapers. Dharisha Bastians, editor at the Sunday Observer, told Al Jazeera she stepped aside late on Friday because she was asked by employees loyal to Rajapaksa to “cede editorial control”. “They wanted to know what was appearing in the paper tomorrow,” she said. Rathindra Kuruwita reported from Colombo. Zaheena Rasheed reported and wrote from Doha.